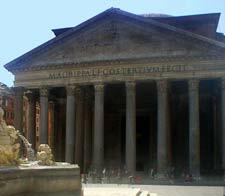 Much of our current terminology about time and time keeping originated during Roman times. After the Julian reform of 46 B.C. the Roman calendar -like ours, which is its offspring -was governed by the length of the earths circuit of the sun. The twelve months of our year retain by the sequence, the length, the names which were assigned them by the genius of Caesar and the prudence of Augustus. From the beginning of the empire each of them, including February in both ordinary years and leap year, contained the number of days to which we are still accustomed. Another element of Roman time that is familiar to us is the the week. The week divided into seven days, named after planets was borrowed from the Babylonians by way of the Jews. The seven day week of late Roman times has survived in the Latinate names for the days (except for Sunday, "the Lord's Day"). In English we substitute a Germanic divinity's name for Tuesday, Wednesday, Thursday and Friday. 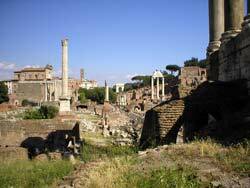 The seven day week did not become part of Roman life until late in their history (321 AD). Before this time, the Romans had a division of the month based on a market day recurring every eight days. The market day was called nundinae (novem dies = "nine days," the Romans counted both ends of a series), but this unit of time did not seem to shape the lives of the ancient Romans the way our week does for ours with its regular recurring rest days at its end (Saturday and Sunday). In addition to the old official division of the months by the Calends (first of each month), the Nones (the fifth or seventh day) and the Ides (the thirteenth or fifteenth day), the division into weeks of seven days is subordinate to the seven planets whose movements were believed to regulate the universe. By the beginning of the third century this usage had become so firmly anchored in the popular consciousness that Dio Cassius considered it specifically Roman. With only one minor modification-the substitution of the day of the Lord, for the day of the Sun, it has in most countries of Latin speech survived both the decadence of the astrologers and the triumph of Christianity. Finally each day of the seven was divided into twenty-four hours which were reckoned to begin, not as with the Babylonians, at sunrise, nor, as among the Greeks, at sunset, but as but as is still the case with us, at midnight. 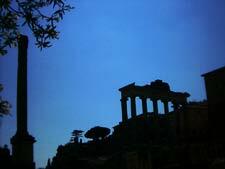 This ends the analogies between time a the ancients counted it and as we do; the Latin hours, late Intruders Into the Roman day, though they bear the same name and were of the same number as ours, were in reality very different. Both word and thing were an invention of the Greeks deriving from the process of mensuration. Toward the end of the fifth century B.C. they had learned to observe the stages performed by the sun in its march across the sky. The sun-dial of Meton which enabled the Greeks to register these, consisted of a concave hemisphere of stone, having a strictly horizontal brim, with a pointed metal stylus rising in the centre. As soon as the sun entered the hollow of the hemisphere, the shadow of the stylus traced in a reverse direction the diurnal parallel of the sun. Four times a year, at the equinoxes and the solstices, the shadow movements thus obtained were marked by a line incised in the stone; and as the curve of the spring equinox coincided with that of the autumn equinox, three concentric circles were finally obtained, each of which was then divided into twelve equal parts. All that was further needed was to join the corresponding points on the three circles by twelve diverging lines to obtain the twelve hours which punctuated the year's course of the sun as faithfully recorded by the dial. Hence the dial derived its name "hour counter", preserved in the Latin horologmm and in the French horloge. Following the example of Athens, the other Hellenic cities coveted the honor of possessing sun-dials, and their astronomers proved equal to the task of applying the principle to the position of each. The apparent path of the sun varied of course with the latitude of each place, and the length of the shadow cast by the stylus It was consequently different in one city and another. At Alexandria it was only three-fifths of the height of the stylus, at Athens three-quarters; it was nearly nine-elevenths at Tarentum and reached eight-ninths at Rome. As many different sun-dials had to be constructed as there were different cities. The Romans were among the last to appreciate the need. And just as they felt no need to count the hours till two centuries after the Athenians, so they took another hundred years to learn to do it accurately. At the end of the fourth century B.C. they were still content to divide the day into two parts, before midday and after. Naturally the important thing was then to note the moment when the sun crossed the meridian. One of the consul's subordinates was told off to keep a lookout for it and to announce it to the people busy in the Forum, as well as to the lawyers who, if their pleadings were to be valid, must present themselves before the tribunal before midday. The herald's instructions were to make his announcement when he saw the sun "between the rostra and the graecostasis (a place in the Forum)"
By the time of the wars against Pyrrhus some slight progress had been made by dividing the two halves of the day into two parts: into the early morning and forenoon on one hand; and afternoon and evening on the other. But it was not until the beginning of the First Punic War in 264 B.C. that the "hours" and horologium (sun-dial, see sidebar) of the Greeks were introduced into the city. One If the consuls of that year, Valerius Messalla, had brought back with other booty from Sicily the sun-dial of Catana and set it up as it was on the comitium (an assembly place), where for more than three generations the lines engraved on its face for another latitude continued to supply the Romans with an artificial time. In spite of the assertion of Pliny the Elder that they blindly obeyed it for ninety-nine years, we must think that they persisted in ignorance rather than in willful error. They probably took no interest at all in Messalla's sun-dial and continued to govern their day in the old happy-go-lucky manner by the apparent course of the sun above the monuments of their public places, as if the horologium had never existed. In the year 164 B.C., however, three years after Pydna, the enlightened generosity of the censor Q. Marcius Philippus endowed the Romans with their first horologium accurately calculated for their own latitude and hence reasonably accurate, and if we are to believe Pliny the Naturalist, they welcomed the gift as a coveted treasure. For thirty years their legions had fought in Greek territory, almost without ceasing, first against Philip V, then against the Aetolians and Antiochus of Syria, finally against Perseus; and they had gradually become familiar with the possessions of their enemies. At times, perhaps, they had toyed, without undue success, with a system of hours a trifle less erratic and uncertain than the one that had hitherto sufficed them. So they were pleased to have a sun-dial brought home and fitted up in their own country. Not to be behind Q. Marcius Philippus, the censors who succeeded him in office, P. Cornelius Scipio Nasica I and- M. Popilius Laenas, completed the work he had begun by flanking his sun-dial with a water-clock to supplement its services at night or on foggy days. It was more than a hundred years since the Alexandrians had equipped themselves with water-clocks which Ctesibius had evolved from the ancient water-clocks to remedy the inevitable failure of the horologium proper. This became known in Latin as the horologium ex aqua. Nothing could well have been simpler than the mechanism of the water-clock. Let us imagine the water-clock- that is, a transparent vessel of water with a regular intake- placed near a sun-dial. When the gnomon casts its shadow on a curve of the vessel, we need only to mark the level of the water at that moment by incising a line on the outside of the water container. When the shadow reaches the next curve of the polos, we make another mark, and so on until the twelve levels registered correspond to the twelve hours of the day chosen for our experiment. This being granted, it is clear that if we give our clepsydra a cylindrical form we can engrave on it from January to December twelve vertical lines corresponding to the twelve months of the year. On each of these verticals we then mark the twelve hourly levels registered for the same day of each month; and finally, by joining with a curved line the hour signs which punctuate the monthly verticals, we can read off at once from the level of the water above the line of the current month the hour which the needle of the sun-dial would have registered at that moment-if the sun had happened to be shining. Once the sun-dial had lent its services for grading the water- clock, there was no further need to have recourse to the dial, and it was a simple matter to extend the readings to serve for the night hours. It is easy to imagine that the use of clepsydrae soon became general in Rome. The principle of the sun-dial was still sometimes applied on a grandiose scale: in 10 B.C., for instance, Augustus erected in the Campus Martius the great obelisk of Montecitorio to serve as the giant gnomon whose shadow would mark the daylight hours on lines of bronze inlaid into the marble pavement below. Sometimes, on the other hand, it was applied to more and more minute devices which eventually evolved into miniature solaria or pocket dials that served the same purpose as our watches. Pocket sun-dials have been discovered at Forbach and Aquileia which scarcely exceed three centimeters in diameter. But at the same time the public buildings of the city and even the private houses of the wealthy were tending to be equipped with more and more highly perfected water-clocks. From the time of Augustus, clepsydrarii and organarii rivaled each other in ingenuity of construction and elaboration of accessories. 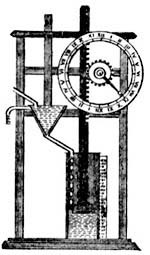 As our clocks have their striking apparatus and our public clocks their peal of bells, the horologia ex aqua which Vitruvius describes were fitted with automatic floats which "struck the hour" by tossing pebbles or eggs into the air or by emitting warning whistles. The fashion in such things grew and spread during the second century of our era. In the time of Trajan a water-clock was as much a visible symbol of its owner's distinction and social status as a piano is for certain strata of our middle classes today. In Petronius' romance, which represents Trimalchio as "a highly fashionable person" , his confederates frankly justified the admiration they felt for him: "Has he not got a clock in his dining-room? And a uniformed trumpeter to keep telling him how much of his life is lost and gone?" Trimalchio, moreover, has stipulated in his will that his heirs shall build him a sumptuous tomb, with a frontage of one hundred feet and a depth of two hundred, "and let there be a sun-dial in the middle! so that anyone who looks at the time will read my name whether he likes it or not." This quaint appeal to posterity would have no point if Trimalchio's contemporaries had not been accustomed frequently to consult their clocks. It is clear that the hourly division of the day had become part and parcel of their everyday routine. On the other hand, it would be an error to suppose that the Romans lived with their eyes glued to the needles of their sun-dials or the floats of their water-clocks as ours are to the hands of our watches. They were not yet like us the slaves of time, for they still lacked both perseverance and punctuality. In the first place, we may be very sure that the agreement between the sun-dial and the water-clock was still far from being exact. The gnomon of the sun-dial was correct only in the degree in which its maker had adapted it to the latitude of the place it where it stood; and as for the water-clock, whose measurements lumped all the days of one month together though the sun would have lighted each differently, its makers could never prevent certain inaccuracies in its floats creeping in to falsify the corrections they had been able to make in the readings of the gnomon. If anyone asked the time, he was certain to receive several different answers at once for, as Seneca asserts, it was impossible at Rome to be sure of the exact hour; and it was easier to get the philosophers to agree among themselves than the clocks. Time at Rome was never more than approximate. Time was perpetually fluid or, if the expression is preferred, contradictory. The hours were originally calculated for daytime; and even when the water-clock made it possible to calculate the night hours by a simple reversal of the data which the sun-dial had furnished, it did not succeed in unifying them. The horologia ex aqua was built to reset itself, that is, to empty itself afresh for night and day. Hence a first discrepancy between the civil day, whose twenty-four hours reckoned from midnight to midnight, and the twenty-four hours of the natural day which was officially divided into two groups of twelve hours each, twelve of the day and twelve of the night! Nor was this all. While our hours each comprise a uniform sixty minutes of sixty seconds each, and each hour is definitely separated from the succeeding by the fugitive moment at which it strikes, the lack of division inside the Roman hour meant that each of them stretched over the whole interval of time between the preceding hour and the hour which followed; and this hour interval instead of being of fixed duration was perpetually elastic, now longer, now shorter, from one end of the year to the other, and on any given day the duration of the day hours was opposed to the length of the night hours. For the twelve hours of the day were necessarily divided by the gnomon between the rising and the setting of the sun, while the hours of the night were conversely divided between sunset and sunrise; in proportion as the day hours were longer at one season, the night hours were, of course, shorter, and vice versa. The day hours and night hours were equal only twice a year: at the vernal and autumnal equinoxes. They lengthened and shortened in inverse ratio till the summer and winter solstices, when the discrepancy between them reached its maximum. At the winter solstice (December 22), when the day had only 8 hours, 54 minutes of sunlight against a night of 15 hours, 6 minutes, the day hour shrank to 44 minutes while in compensation the night hour lengthened to 1 hour, 15 minutes. At the summer solstice the position was exactly reversed; the night hour shrank to its minimum while the day hour reached its maximum. I. Hora prima from 7:33 to 8:17 A.M. VII. septima 12:00 to 12:44 P.M.
VI. sexta 11:15 to 12.00 noon. XII. duodecima 3:42 to 4:27 P.M. The night hours naturally reproduced in rigorous antithesis the equivalent fluctuations, with their maximum length at the winter solstice and their minimum at the summer solstice. These simple facts had a profound influence on Roman life. For one thing, as the means of measuring the inconstant hours remained inadequate and empirical throughout antiquity, Roman life was never regulated with the mathematical precision which The above schedule, drawn up according to our methods, might suggest, and which tyrannizes over the employment of our time. Busy as life was in the city, it continued to have elasticity unknown to any modern capital. For another thing, as the length of the Roman day was indefinitely modified by the diversity of the seasons, life went through phases whose intensity varied with the dimensions of the daily hour, weaker in the somber months, stronger when the fine and luminous days returned; which is another way of saying that even in the great swarming city, life remained rural in style and in pace.